From the Neurology Department (K.P., E.L.), University of Pennsylvania, Philadelphia; Rheumatology Department, Sant Joan de Deu Children's Hospital (E.I., J.A. ), University of Barcelona, Spain; Department of Pathology (M.N. ), University of Pennsylvania, Philadelphia; Pediatric Neuroimmunology Unit (V.G.-Á., T.A. ), Sant Joan de Déu Children's Hospital, University of Barcelona, Spain; Department of Pathology (M.S. ), Sant Joan de Déu Children's Hospital, University of Barcelona, Spain; and Neuroimmunology Program (A.S., T.A. ), IDIBAPS-Hospital Clinic, University of Barcelona, Spain. Objective To report 2 patients with anti–myelin oligodendrocyte glycoprotein (MOG)-associated encephalitis who were initially misdiagnosed with small vessel primary CNS vasculitis. Methods Review of symptoms, MRI and neuropathologic features, and response to treatment. MOG antibodies were determined in serum and CSF using a cell-based assay. Results Symptoms included fever, headache, and progressive mental status changes and focal neurologic deficits. CSF studies revealed lymphocytic pleocytosis, and both patients had abnormal brain MRIs. Brain biopsy samples showed prominent lymphocytic infiltration of the wall of small vessels; these findings initially suggested small vessel CNS vasculitis, and both patients were treated accordingly. Although 1 patient had a relapsing-remitting course not responsive to cyclophosphamide, the other one (also treated with cyclophosphamide) did not relapse. Retrospective assessment of serum and CSF demonstrated MOG antibodies in both cases, and review of biopsy specimens showed absence of fibrinoid necrosis (a pathologic requirement for small vessel CNS vasculitis). Conclusions Anti–MOG-associated encephalitis can be mistaken for small vessel CNS vasculitis. This is important because the diagnosis of anti–MOG-associated encephalitis does not require brain biopsy and can be established with a serologic test. The diagnosis of small vessel primary CNS vasculitis is challenging because conventional and brain MRI angiography are negative, and brain biopsy remains as the only definite diagnostic test.1 However, brain biopsy is invasive and may be uninformative because of sampling error. 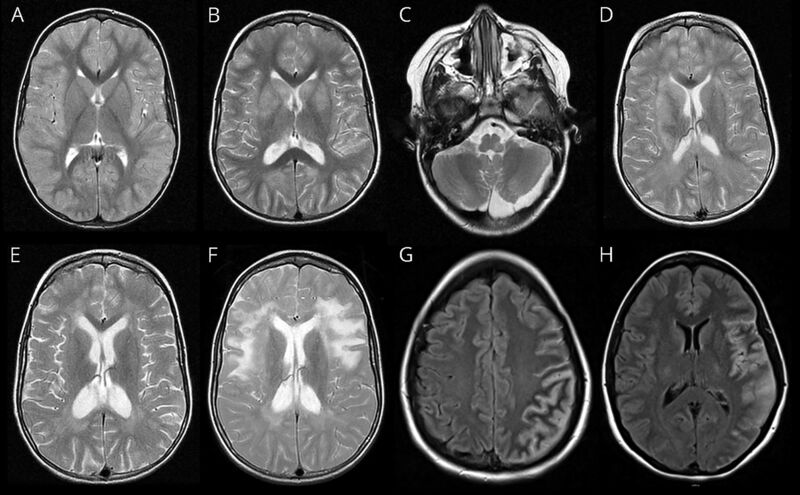 Here, we describe 2 patients with myelin oligodendrocyte glycoprotein (MOG) antibody–associated encephalitis2 who were initially misdiagnosed with small vessel CNS vasculitis based on biopsy findings. Physicians should be aware of this potential misdiagnosis because it has important clinical implications. In patient 1, biopsy of the right temporal lobe showed small vessel perivascular lymphocytic infiltration (A, hematoxylin-eosin staining; B, magnification of the vessel shown in panel A). Inflammatory infiltrates included T and B lymphocytes (not shown) in association with edema, perivascular demyelination, and reactive gliosis (C and D, luxol fast blue staining). In patient 2, biopsy of the left temporal lobe showed marked perivascular lymphocytic infiltrates involving the vessel wall (E, hematoxylin-eosin staining). The infiltrates were also composed of T lymphocytes (F, CD3 immunostaining), B lymphocytes (G, CD20 immunostaining), and macrophages (H, anti-CD68 immunostaining). Myelin staining did not show clear evidence of demyelination (not shown). No necrosis or fibrin deposition was identified (not shown). Scale bar 200 μm in A and C, 500 μm in E, and 100 μm in B, D, and F–H. A 39-year-old woman with a history of ulcerative colitis treated with mesalamine and budesonide developed severe, progressive left temporo-parietal headache associated with nausea and photophobia. Shortly after neurologic symptom onset, she developed intermittent fever. Peripheral leukocytosis with neutrophilic predominance and elevated C-reactive protein were identified (table). Brain MRI showed hyperintense gyriform fluid-attenuated inversion recovery signal over the left temporal, parietal, and occipital lobes (figure 1G–H). CSF analysis showed pleocytosis and elevated protein concentration, and the patient was started on empiric antibiotics and acyclovir. Six days later, she developed expressive aphasia, confusion, and agitation, and bilateral VI cranial nerve palsies. Repeat brain MRI showed no changes, and CT angiography demonstrated no clear evidence of vasculitis. A biopsy of the left parietal lobe and dura showed interstitial and perivascular lymphocytic infiltrates with marked involvement of the vessel wall (figure 2E–H). There was no clear evidence of demyelination (data not shown). These findings led to suspect CNS vasculitis, and high-dose IV steroids and oral cyclophosphamide were started. Four months later, cyclophosphamide was discontinued because of elevated transaminases. The dose of prednisone was tapered over the course of 2 years. During the follow-up, the brain MRI normalized at 4 months and the neurologic examination at 9 months; her only complaints were mild aphasia when tired and chronic daily headache. Retrospective analysis of stored CSF obtained by the time of symptom onset showed MOG-IgG antibodies (1:8). We describe 2 patients initially diagnosed with small vessel CNS vasculitis but who in fact had anti–MOG-associated encephalitis. The first patient received standard treatment for CNS vasculitis, including cyclophosphamide and steroid-sparing drugs. Although this treatment led to initial stabilization of symptoms, the patient developed new relapses until he was transitioned to a B-cell depletion therapy with good clinical and serologic response. In the second patient, the finding of MOG antibodies did not change the treatment strategy because she was already clinically stable; however, an earlier detection of these antibodies could have prevented the brain biopsy. In retrospect, none of these patients fulfilled the criteria for small vessel CNS vasculitis. Although the presence of inflammatory cells in the vessel walls is sufficient to diagnose medium or large vessel vasculitis, signs of vessel damage such as fibrin deposition and/or necrosis (absent in our patients) must also be present to meet the criteria for small vessel vasculitis. Diapedesis of leukocytes takes place in small vessels, and the presence of inflammatory cells in the walls does not necessarily imply a pathologic process. Moreover, the pathology of CNS vasculitis is usually focal or segmental, and the brain biopsy specimen can be negative or not meet the full diagnostic criteria.4 As our patients reveal, the presence of lymphoid cells in vessel walls must be interpreted with caution, particularly when the differential diagnosis includes encephalitis with lymphocytic infiltrates. In this context, the presence of lymphocytes in the brain parenchyma away from the vessel walls favors secondary involvement of the vessels rather than a primary vasculitic process. Whether other cases of anti-MOG encephalitis may have been misdiagnosed as CNS vasculitis is unknown. There are reports of patients diagnosed with CNS small vessel vasculitis by brain biopsy who later developed myelitis or optic neuritis5 (symptoms suggestive of MOG encephalitis),2,3 making us to postulate that this misdiagnosis may not be unusual. This study was supported in part by Fundació Marató de TV3 (20141830). K. Patterson received research support from the NIH/NINDS. E. Iglesias, M. Narallah, V. Gonzalez-Alverez, and M. Sunol report no disclosures. J. Anton served on the scientific advisory boards of Novartis, Sobi, and Gebro; received travel funding and/or speaker honoraria from AbbVie, Roche, Pfizer, Sobi, and Gebro; and served on the speakers' bureau of AbbVie, Pfizer, Roche, and Gebro. A. Saiz received consulting compensation and speaker honoraria from Bayer-Schering, Merck Serono, Biogen Idec, Sanofi-Aventis, Teva, Novartis, and Roche. E. Lancaster served on the advisory boards of Grifols, Amgen, and Janssen; received speaker honoraria and travel funding from Grifols; consulted for Medimmune, Merck, and Novartis; received fees from the Federal Vaccine Injury Compensation Program; received research support from Grifols and the NINDS; and provided medical legal consultation for Rogers Towers PA, Orlando Health, and Wilson, Elser, Moskowitz, Edelman & Dicker LLP. T. Armangue received research support from the Mutua Madrileña Foundation. Full disclosure form information provided by the authors is available with the full text of this article at Neurology.org/NN. Received by Neurology August 16, 2018. Accepted in final form October 19, 2018. The authors thank Professor Josep Dalmau for his valuable critical review of the manuscript. The Article Processing Charge was funded by the Clinic Foundation.
. Angiography-negative primary central nervous system vasculitis in children: a newly recognized inflammatory central nervous system disease. Arthritis Rheum 2005;52:2159–2167.
. Primary central nervous system vasculitis: pathology and mechanisms. Acta Neuropathol 2012;123:759–772.
. Childhood central nervous system vasculitis. Handb Clin Neurol 2013;112:1065–1078.